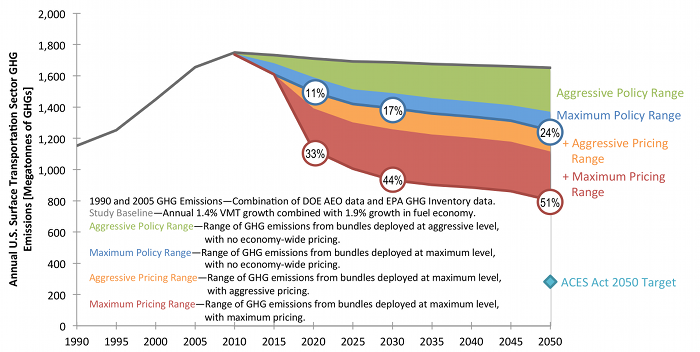 Confusingly, the “bundles” in the study and the graphs showing potential emission reductions all exclude carbon pricing or fuel taxes or other economy-wide pricing initiatives. These policies are covered elsewhere in the text, but the presentation is quite confusing, especially considering that these are likely the most important policies. I will attempt to cover them more clearly here. The study sponsors and steering committee are largely so-called “interest groups” such as environmental NGOs, Shell Oil and ITS America. Surprisingly, this membership hasn’t significantly coloured the study findings or objectivity. The study does not make recommendations and the dry, clinical tone is undoubtedly a requirement for a neutral policy study of this sort with a diverse set of stakeholders. The study is quite U.S.-centric, but I feel the findings could be easily extrapolated to most English-speaking countries, who have all experienced 65 years of substantial post-war growth in low-density auto-oriented suburbs. What can a full bundle do? The future fuel prices make sense. I was initially concerned that this 2008-09 study might be too optimistic, as it relies on Energy Information Administration (EIA) forecasts, which were notoriously optimistic prior to their 2009 release. However, the study clearly tried to grapple with the issue in the absence of EIA guidance and they came up with a fairly reasonable scenario, midway between the EIA’s 2012 “baseline” and “high oil price” scenarios extrapolated out to 2050. That fuel price assumption is essentially $3.70/gal in 2010 with a 1.2% real annual increase thereafter, giving about $6/gal by 2050 (in real dollars). Travel activity policies can have a real effect, up to a quarter of transportation emissions. Additional policies in the vehicle and fuel technology areas are required to hit the long-term reduction targets. The report’s executive summary and figures don’t hammer these points home enough, in my view. 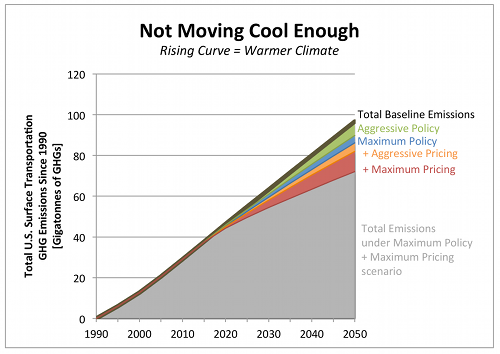 Of course, the climate will continue to change unless we can reach zero annual emissions. Until then, each year’s emissions will accumulate in the atmosphere, adding to the warming. The figure above shows the same information in terms of “total accumulated emissions to the atmosphere between 1990 and 2050.” As long as the emissions curve keeps going up, the climate will keep getting warmer. What can individual policies do? The report’s executive summary does a poor job of comparing individual policies or policy categories. I will draw my own highlights instead. Let’s take a look at each policy category and the “best of breed” policy from an emissions perspective, at an “aggressive” deployment level. Pricing measures are number one, with a bullet. For anyone who’s been around the transportation field for a while, this is fully expected. The number two and three measures are probably surprises to many people: speed limit reductions and eco-driving. There’s a reason why Nixon implemented speed limit reductions in the 1970s: they really work at reducing gasoline usage. Eco-driving is also the only effective policy in the “system operations” group (which otherwise consists of ITS road technologies like ramp metering and incident management). Numbers four through seven are the usual suspects in “green” circles. But the order may come as a surprise – public transit is a long way down the list. Freight emissions are tough: the maximum impact policy is quite small. “Bottleneck relief” and “capacity expansion” make the problem worse, not better. The top strategies are all quite cheap. The most popular strategies (transit, bottleneck relief) are extremely expensive. All of this hinges on the underlying analysis, but I feel it’s pretty solid. The appendices of the report give all of the gory details; they’re stellar examples of how to do high-level “sketch” planning. At some point, I’d be curious to try it out with Canadian data; I doubt the results would be very different, though. What does “maximum” deployment look like? Thanks Dave – very useful. Looking forward to the second installment.